Asia Minnes closed out the Canadian Junior Championships with five gold and six total medals. Asia Minnes picked up a fourth gold on day 4 in Toronto. 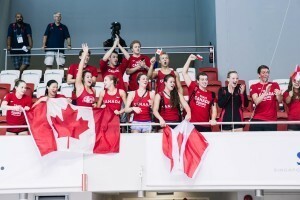 Check out a recap of day 3 at the RBC Canadian Junior Championships. 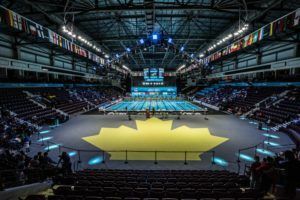 Day 2 from the Canadian Junior Championships may not have seen as big a performance as Taylor Ruck’s 2:07 200 back, which we saw on day 1, but there were some impressive performances and some very close races. The stars of the session were Etobicoke’s Justin Konik and Asia Minnes, who is swimming unattached. Konik started off with a big victory in the boys 14-16 100 freestyle, negative splitting his way to a time of 51.84, closing in a scorching 25.69. Thomas Boyd of Sudbury Laurentian took silver in 52.70. 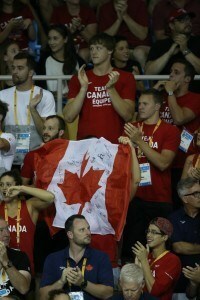 Konik was back in action later, as he led off the Etobicoke 4×200 free relay to gold with a split of 1:53.08. Etobicoke won in 7:38.85 over Island Swimming (7:41.25). Minnes, swimming in the girls 13-14 category, managed to medal in the only two individual events of the evening. She started things off with a silver in the 100 free, losing out to Brooklyn Douthwright of BEAST by one one-hundredth of a second, 58.15 to 58.16. It was not long after when Minnes was back in the water in the 400 IM, winning gold by five seconds in 4:56.65. Emma O’Croinin of Edmonton Keyano took silver in 5:02.01. 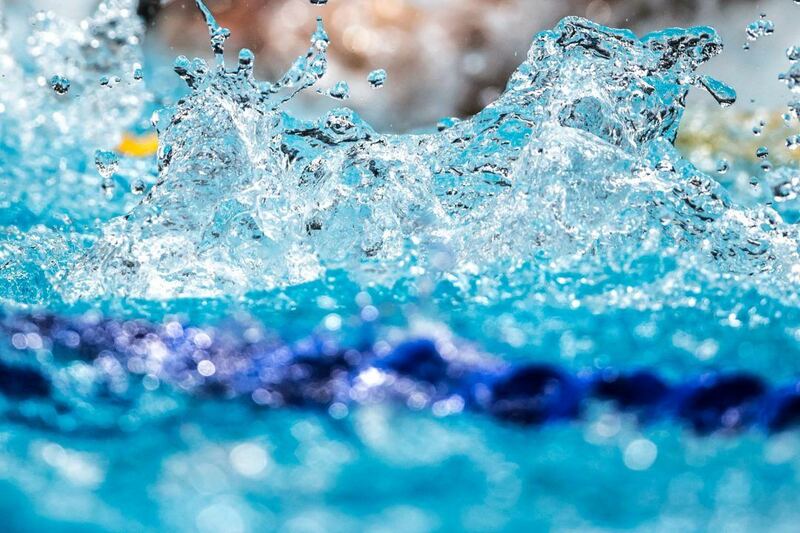 Arguably the most impressive swim of the night came in the boys 17-18 100 free, where Mehdi Ayoubi cracked 50 seconds for the first time in 49.93. Stephen Calkins of the University of Calgary Swim Club took silver in 51.08. Other close finishes came in the girls 15-17 100 free and the boys 14-16 400 IM. In the 100 free, Ainsley McMurray of Cote Saint-Luc got by Kyla Leibel of Red Deer Catalina by just over three tenths, 56.29 to 56.62. Brodie Young of Hyack and Collyn Gagne of Oakville went head-to-head in the 400 IM, battling all the way to the wall with Young prevailing in 4:30.48 to Gagne’s 4:30.67. In the 17-18 400 IM, William Marois (CASE) turned at 300 with a slight disadvantage to Frederik Kamminga (OSC), but threw down a 1:00.2 free split to win by a wide margin in 4:27.97. Both Calkins and Ayoubi swim at the University of Denver. Ayoubi trains in montreal at camo with coach Greg Arkust! Ayoubi trains at camo in Montreal with coach Greg Arkust! Where does Asia Minnes train? USA? Did she used to live in Canada? She trained in the Phoenix area. 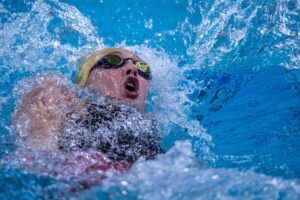 Her father coached her and she was attached to Neptune swim team. It seems like Visa requirements meant she had to leave the US, so she was in New Zealand prior to Canadian Juniors. Incredible athlete, nice person, wish her all the best. She was born and raised in AB/BC – you can find her on the Vernon Kokanee record boards as a 10 year old, and on the VIR(Vancouver Island) record list as well as a youngster. Swam some meets in BC last Nov/Dec. Family likes to travel, I guess that makes them sketchy Canadians. Nice family, happy for them.